WASHINGTON (AP) — With demonstrators chanting outside, the Supreme Court began hearing arguments Monday on the fate of President Barack Obama’s historic health care overhaul, no less controversial two years after Democrats pushed it to passage in Congress. Twenty-six states are leading the legal challenge, while Republican presidential candidates are vowing to repeal it after throwing Obama out of office. The law, much of which has still to take effect, would require almost all Americans to obtain health insurance and would extend coverage to more than 30 million people who now lack it. The law would be the largest expansion in the nation’s social safety net in more than four decades. The nine justices began hearing arguments a little after 10 a.m. EDT.
. A four-person student band from Howard University was part of the group favoring the law, playing New Orleans-style jazz tunes. A decision is expected by late June, in the midst of a presidential election campaign in which all of Obama’s Republican challengers oppose the law and promise its repeal, if the high court doesn’t strike it down first. People hoping for a glimpse of the action have waited in line all weekend for the relatively few seats open to the public. 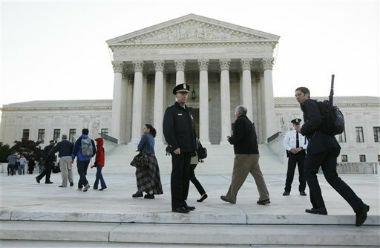 The justices allotted the case six hours of argument time, the most since the mid-1960s. Nurses Lauri Lineweaver and Laura Brennaman, who are completing doctoral degrees, had been waiting since noon Sunday and got tickets to see arguments. “It’s an honor to be in the court,” said Lineweaver, 35. The court will release audio recordings of the arguments on the same day they take place. The first time that happened was when the court heard argument in the Bush v. Gore case that settled the 2000 presidential election. The last occasion was the argument in the Citizens United case that wound up freeing businesses from longstanding limits on political spending. Outside groups filed a record 136 briefs on various aspects of the court case. The first arguments Monday concern whether the challenge is premature under a 19th century tax law because the insurance requirement doesn’t kick in until 2014 and people who remain uninsured wouldn’t have to pay a penalty until they file their 2014 income taxes in early 2015. The biggest issue before the court is Tuesday’s argument over the constitutionality of the individual insurance requirement. The states and the National Federation of Independent Business say Congress lacked authority under the Constitution for its unprecedented step of forcing Americans to buy insurance whether they want it or not. Republicans are leading the fight to kill the law either by the court or through congressional repeal. They say the worst fears about what they derisively call “Obamacare” already have come to pass in the form of higher costs and regulations, claims that the law’s supporters dispute. Associated Press writers Pete Yost, Jesse Holland and Jessica Gresko contributed to this report.